For more financial ideas and resources, including access to the free cash flow forecast template mentioned in the show (and guidance on how to use it), sign up for our weekly Essential Business Nudges – quick tips to help you build your skills and build your business. Julie Stanford: Hello, I’m Julie Stanford, and welcome once again to Essential Business Radio. 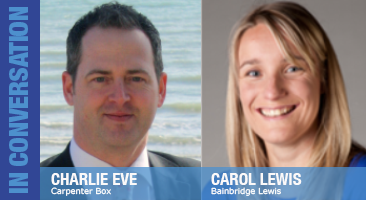 Joining me today to discuss the key tools for managing your money in the business, are two chartered accountants: Carol Lewis, partner at Bainbridge Lewis, and Charlie Eve, partner at Carpenter Box. I’ll start with you Carol. I know you like working with smaller businesses, I think you said. Why is that? Carol Lewis: I just love that whole passion when you start your business, you know, it’s your ‘baby’ isn’t it? People are really involved and they’ve got loads of ideas, and it’s all so new to them as well and I like helping people at that stage, I find it really rewarding. Also, to see them go and take that journey and watch their business grow as well is really, really rewarding. Julie Stanford: Yes. So Charlie, what about you? What kind of clients do you like working with? You’re going to have to say all of them really, aren’t you? Julie Stanford: Put you on the spot. Charlie Eve: The owner-managed businesses are the best. Julie Stanford: Really? And why is that? Is it because they’re so close to you. Charlie Eve: Because there’s a passion. Charlie Eve: I love what I do, they enjoy what they do, and you just get a bit of a rapport. The best thing that someone says to me is, “Charlie, you’re not really like an accountant.” It means that they’re able to talk to me. Charlie Eve: When they talk to me, then I can give them the advice that they need. Julie Stanford: You become, in effect, a partner in their business in that you’re one of the people they go to with a very important part of the business which is, the money. Charlie Eve: Many times, you become a friend. Charlie Eve: A friend, not like best friends, but someone that they can confide in, because you are a trusted advisor. There’s many things that clients will tell their accountant that they might not tell other people. There needs to be some sort of ‘confidants’ there. Julie Stanford: Really, now, the reason I’ve asked you to come today is because I wanted to talk to you about managing the money in the business. In another show Carol, [Keeping the right financial records] when we were talking about keeping financial records, you were saying how exciting it is when people can actually understand the figures and start to use them to manage the way the business is going, so with the key tools, one of the things I was thinking about was a budget, is that something that you would advise businesses to use? Carol Lewis: Definitely. I think what you need to do when you’re going to start the budgeting process is think where you want to be in five years’ time, where are you trying to take your business? Do you want to be working three days a week and just enough so you can pay your mortgage, so you’re enjoying it or are you looking to take over the world and be employing 50 people. You need to be thinking about what you want from your business and where are you trying to take it? I usually suggest about a five-year period, I find that’s quite a good period to look over. And then you need to start looking about how you’re going to get to that place in the next five years. Once you’ve got that five-year plan, then you can start looking at what you’re going to do in the first year and start doing a bit more detailed budgeting on what you need to achieve in that first year. Julie Stanford: Use that as a marker. Carol Lewis: Or profit, yeah. Carol Lewis: Profit’s probably the best place to start from. Sometimes as well it’s not just about the financials, people have other goals in there and you have to try and build that into the financial figures. There’s a number of factors that go in to, I think also visualizing it about where you want to go and then trying to turn that back into numbers and what kind of turnover would you need to be doing to go and get to that point. Julie Stanford: So what does that look like. Carol Lewis: Yeah, what does it look like. Julie Stanford: This might be a good point, Charlie, for you to explain the difference between turnover and profit because I have had a number of people look at me quite blankly when I’ve mentioned both of those words. Would you kindly explain the difference for those interested. Charlie Eve: Turnover is your income, your sales. If you sold a widget for £100, and that’s all you did in a year, your turnover would be £100. If you had no costs, then your profit would be £100 because your sales, less your costs makes your profit. If your costs were zero, your profit would be the same as your sales. If you had expenses through the year, I’m making it simple numbers because I haven’t got a calculator in front of me, so if you had expenses of £50, so you’ve got your sales of £100, you’ve got your expenses at £50, then your profit is £50. It’s £100 less £50, makes £50. So your turnover, where you started with the first question is £100, and your profit’s £50. Essentially all profit is, to make it easy, is your sales less your costs. Julie Stanford: Okay. They always say turnover’s vanity, and profit is sanity. Julie Stanford: It’s always odd to me that people rate businesses by the level of turnover, because actually you could have £1,000,000 turnover and only be making £100 profit, therefore the business isn’t quite as exciting as it might appear. Charlie Eve: You see it a lot actually. You’ve prepared some accounts and the client goes, “Oh my turnover was up by such and such,” and you go, “Yes, but actually it’s cost you more to generate that extra turnover than you’ve got from it.” And suddenly reality hits. You think, “I’m going to get a lot more sales if I take on a sales manager.” So you take on a sales manager for £30,000 say, so plus national insurance, you’re up £33,000, and they generate an additional £30,000 worth in sales, well, you’ve lost £3,000, so you really have to think about it. Yeah, turnover is vanity and profit is sanity. How do you start your budget? Julie Stanford: Think then, Carol, about this budget – what is a budget and how would you start to put one together? So once you’ve got this five-year plan and you’re excited about where you want to go and the figures are going to be the way you’re going to get there, in effect, what’s the practical steps you would take? Carol Lewis: First of all, I always go and start with the sales. It’s a really good place to start and it kind of varies on business to business, but for example, if you’re selling a product, you can start looking at unit sales. How many units would I have to go and sell and what’s my average price that I can sell those units for? If you’re service-based you can start looking at the number of hours you’re going to go and sell and what’s your average charge out rate for those hours. It can vary from business to business, but the sales is the best place to start. Once you have those sales, you can start thinking about what costs you’d incur to get those sales. If you’re selling a product you’d have to think about, “Well, what’s that product going to cost me to buy?” If you don’t have a product, you’re a service, you need start thinking about what your overheads are. You know, “Do I need an office? Am I going to need staff? What are they going to get paid?” And then go through it like that. Julie Stanford: And how often, Charlie, would you expect someone to review that budget? You said earlier, Carol, that there would be more detail in the upcoming year. Would you advise your customers to review it frequently, Charlie? How would you do that? Charlie Eve: Frequently, definitely. Sometimes you might have bank finance and they actually require you to do a budget and then you have to review that on a month-by-month basis. I would tend to say, if you’re VAT registered and you’re doing your VAT returns quarterly, then you would look to review your budget on a quarterly basis because you’ve got all your records up to date because you’ve had to to do your VAT return so that’s the point and a great point for you to sort of look and see, “Well how are we doing? How are we doing against budget? Are things not going quite as expected? Or are things going better than expected? Maybe we should flex the budget.” So change the budget to reflect what’s happening now rather than when you set it which may be 3 months, 6 months, a year ago. Julie Stanford: It’s a guide, but it’s a flexible guide. Is that correct? Charlie Eve: It’s your best guess of the future and there are many different circumstances that can change what’s going to happen in the future. Julie Stanford: Now talking about best guess for the future, I want to talk to you about cash flow forecast, as opposed to budget, because I can remember when I was in business and the bank manager would say to me, “I want a cash flow,” and I would think I might as well be writing a fairy story because it seemed to me I was guessing. I was guessing what was going to come in and I was guessing what was going to go out. So Carol, at Banbridge Lewis, why would you say to your clients, “We want a cash flow, we advise you to do this.” What’s the difference between that and a budget and why would you want a cash flow? Carol Lewis: So, the first thing about what’s the difference between a budget and a cash flow, is that a budget is whether you’re going to make a profit or a loss. But, there are very profitable business that don’t necessarily have a lot of money in the bank. You know, they’re two different things, a profit and whether you’ve got cash in the bank. Even if you’re profitable you need to be doing a cash flow forecast so you can work out how much cash you’re going to go and have in the bank. I think there’s a famous saying, was it, “Cash is the life blood of the business”. To create a cash flow, you’d start with what your current bank balance is and then you’re going to sit there and you’re going to look, if you’re doing a short term one, maybe a month, you’re going to look at what money’s going to come into the bank and what money’s going to go out of the bank in that month. It’s really important to look at, for example, your credit terms that you’re giving to your customers. So if you know what your sales were last month and you’re giving your customers 30 days’ credit, you’re going to expect to have that money in in the following month and you’re also going to need to go and look then at what your bills are going to be, that you’re going to have to pay in the following month. So, it’s really important if you’re VAT registered because obviously you’re paying that once a quarter. So you’ve got these sudden large amounts coming out of your bank balance and you need to make sure that you’ve got the balance in there to pay it, so if necessary, you need to be on the phone to your customers saying, “I need you to go and pay me,” so that that money’s in there and ready to go and pay your VAT liability, or maybe your corporation tax bill, or something like that that’s going to come out of your bank account. Julie Stanford: And Charlie, do your Carpenter Box clients, do they do them? Do they do cash flow? Is it something you would really, strongly advise them to do? Charlie Eve: Yes. And I tend to talk to my clients about the difference between budget and cash flow. The budget is essentially your profit and loss that you’re budgeting for the future and all the cash flow is, is a timing difference because if you think about your profit, if you raised an invoice and you received that money straightaway and as soon as you received a bill you paid it straightaway, your cash flow would be exactly the same as your profit because you’ve got your income and your expenses, and same as the example before: £100 income, £100 expenses, well that’s your profit, £50. And your cash flow, you’ve received £100 and you’ve paid out £50, so your cash is £50. All a cash flow is, is the timing of when you received that money. You start with your budget, your profit and loss, what you’re expecting, and then you put it into timings. So, if it takes you 60 days for your sales to be received, and if you’re doing your cash flow in a month-by-month basis, the sales that you made, or that you’re proposing for the month, you would put the cash for that month in two months’ later. Charlie Eve: That’s how it works. You need to have a cash flow because exactly as we’re talking about, it takes longer for people to pay you and sometimes you have to pay out. There will be a cash shortfall. Julie Stanford: So you need to think. Charlie Eve: The cash shortfall has to be managed. Julie Stanford: And also I would imagine, for instance, if you’re looking that you’re going to be going into overdraft, that gives you a few months’ grace really, to be able to go to a bank manager and say, “Look, here’s my cash flow, it looks like things might be a bit tough in a few months time, can I extend my facility and then over a short term period.” It gives you control and peace of mind, Carol, doesn’t it? Carol Lewis: Yeah, it helps you sleep at night. Otherwise you’re always worrying about what’s going to happen next, whereas if you’re predicting it, it just helps. And also it’s almost like a target again. You’ve set yourself a list and you say, “I know I need to get this much income in,” you know what you’ve got to go and do and if one of your customers turns around to you and says, “I can’t pay you this month,” then you know at that point you’re in trouble and you need to come up with an alternative plan. You know, it just gives you, you’re quite right, control of your finances. So let’s think then about other forecasting tools. Not necessarily forecasting tools, but other management tools, good things you want businesses to use to be able to manage that money and get that exciting information to run the business better. Carol, you were excited in our show when we were talking about records, what else would you be expecting your clients to use. What other tools are useful for managing the money? Carol Lewis: It really varies from business to business. I don’t know if anyone has heard the term KPIs, which is key performance indicators, and it’s basically picking out what’s really key to your business. What do you need to know? For example, if you’re a service-based business and you’re selling your hours, you could look at what your average charge out rate is per hour. You can look at how many widgets you’re selling. You need to decide what’s important to your business and then that’s the information that you need to monitor every month on your finances so you know where you are and you know what’s going on and if there’s areas you want to improve like your gross profit margin, how much profit you’re making on your products, then set yourself targets and then monitor that every month so you can see how you’re doing. Julie Stanford: So it’s all right for a business to decide their own key performance indicators? Julie Stanford: I suppose that’s the point, really. It’s how they’re performing within their particular business sector. Carol Lewis: With management accounts, it’s completely all about what do you need to manage your business, there’s not set rules. It’s not like financial accounting when you’re doing your year end statutory accounts, managements accounts is about what you need to know to run your business and it’s your decision. Yeah, I think that’s quite exciting. You can pick for yourself about what you need to know. Julie Stanford: It’s really exciting in the sense that it puts the business owner in the driving seat. Julie Stanford: And they’re making decisions based on good, solid information. Because I talk to a lot of businesses, and I know that they struggle with that very often. As you said Charlie, they think that they’ve got a great turnover, therefore they must be running a profitable business and that’s not always true is it? Julie Stanford: Charlie, at Carpenter Box, I would just like to know, with your clients do you expect them to be able to read profit and loss, and balance sheets, or is it something that you would be patiently explaining every time they come in to bring their accounts to you? Charlie Eve: It really varies. Some people say to me, “Charlie, I don’t understand what it’s all about. Am I doing okay or aren’t I?” And you explain that. Some people are very, very keen on understanding the information. I take time every time to go through the profit and loss and balance sheet. Most people have a good idea of the profit and loss, especially the bottom figure because that’s what relevant to them, and to business owners it’s not just the profit, it’s obviously the tax that’s payable that’s relevant and it’s a lot of things like, “Oh, why is my tax so high? What can we do to change that?” And that all surrounds the profit and loss account. And the balance sheet is a point in time. What I tend to say is, it’s not the value of your business, if all those items on the balance sheet were converted to cash, let’s say, your fixed assets that were there, so if you’ve got cars or fixtures and equipment, if they were sold at the price on the balance sheet, you’d have a certain amount of money. If you received all the money from everybody who owed you, your debtors, if you sold your stock at the cost to you and if you paid everybody you owed, the balance sheet figure at the bottom would be the amount that you had in your bank account. So again, the balance sheet is a timing issue that revolves back to cash. Julie Stanford: Because I think that they need to both be looked at. Charlie Eve: It’s important to think, the balance sheet shows a figure, that’s not what your business is worth, but it’s what could be converted into cash if everything was sold at the value that is showing on the balance sheet. Julie Stanford: At a particular point in time. Charlie Eve: It’s a photograph or snap shot of a point in time which happens to be at the year end, if you’re preparing year end accounts or the quarter end if you’re doing quarterly accounts. What is breakeven and why is it important? Julie Stanford: Excellent. Now I’m going to throw a curve ball over to Carol now, but I did warn you before we put it on air. But I want to really try and understand, breakeven. Julie Stanford: Because breakeven is a very important figure in a business or a thing to know in a business, isn’t it? Now, are you willing to take on the challenge, Carol? Carol Lewis: Yep. I’m willing to take the challenge. Julie Stanford: What is breakeven and why is it so important for a business owner to know about it? Carol Lewis: If you’re selling widgets, sorry to go back to widgets. Julie Stanford: These widgets are obviously very popular! Carol Lewis: I know. So going back to widgets, if you were selling widgets for £10, and to buy that widget in was costing you £5, so you’re making a £5 profit on the widgets. If your overheads, your fixed costs about the business were then £1,000 a month, you would then need to go and sell 200 widgets to go and break even. So it’s really important for a business because you need to know how many widgets you need to go and sell in a month so that you can make a profit. Julie Stanford: Right. So would you do the figure over a month period, or would you do it over a quarter. How does that work? Carol Lewis: You could do it over a year or you could do it over a month. I think it’s quite good to do it over a month so you have monthly targets to be looking at. But, you know, then you could maybe average it out over a year. Julie Stanford: And where do variable costs come in to the equation then? Carol Lewis: So the variable costs are the £5 on the product, because obviously the more products that you sell, you buy more in. So that’s a variable cost. Carol Lewis: Whereas your overheads are a fixed cost. So your rent, your staff costs, your electricity, that’s fixed. It doesn’t matter how many widgets you sell, your fixed costs are going to always be the same. Julie Stanford: Which is why they’re called fixed I suppose. Carol Lewis: You’re looking to make a gross profit to cover your fixed overheads basically. It works quite well if you’re a new startup business. I often get people to think about how much money do they need to survive, you know, to pay their mortgage and stuff. And then they need to get themselves to that point, their profit to that point, so that they can go and cover their costs. Because people often forget that they’re waged, that what they need to take home is an important cost in a business as well. So when starting out it’s really key to do a breakeven analysis. Julie Stanford: Charlie, what would you say about breakeven? You see, I’m throwing that curve ball to you now. Oh, he’s happy to catch it. Charlie Eve: Yes. Because I’ve just learned from Carol. Sometimes with breakeven it’s easy to break it down a bit further and actually think about if your sales are just selling your time, so let’s say you’re a consultant, it makes it easier. Because you’re going to have a whole load of fixed costs. You’re going to have your office, you’re going to have your electricity, your phone, your insurance, so all those costs you’re going to pay each year. And each year, it’s pretty much going to be the same. So let’s say that was £20,000, As a consultant, the only income is your income. So you need to make £20,000 to cover those costs. That’s your breakeven point, before taking any money for yourself. So as Carol said, if you then had £10,000 a year of your own cost that you need to cover, and to break even personally, your sales would have to be £30,000. £20,000 to cover your fixed cost, £10,000 to cover your personal costs. If you’re not producing something, it’s easier to work out your breakeven, but essentially the formula is the same. Julie Stanford: And I suspect that people shy from it because it’s a ‘cold, light of day’ figure. But, it also gives you a clear goal. You’re actually putting a figure on the thing you have to do, aren’t you Carol? Carol Lewis: Definitely. I think goals are really important in businesses, it’s a really big motivator. And if you don’t have that goal there, it’s harder to meet it. It’s statistically proven that if you set goals you actually achieve higher than if those goals hadn’t been there. So I think it is really important as a business owner to set yourself these goals. Julie Stanford: Following on from that then, they need to be quite big goals, or at least a little bit further. Carol Lewis: Realistic. They have to be realistic goals obviously. Carol Lewis: But challenging, yes. Julie Stanford: Realistic, but challenging. Yeah. So thinking then about other key tools for managing the money, are there any we’ve missed? We’ve covered budget, we’ve thought about breakeven, we’ve thought about, it’s not a key tool, but it’s a key piece of information you need. We’ve got cash flow, we talked about Key Performance Indicators, is there anything else that you feel that businesses really could be benefiting from using? Charlie Eve: I think we haven’t spoken about management accounts. Julie Stanford: No, we haven’t. Charlie Eve: And that’s an essential tool, making sure you’ve understood where you’ve been to where you’re going to go. Management accounts, making sure you know what profit you’ve made. That’s really key. Julie Stanford: Would you be thinking that people should do that every month? Charlie Eve: It depends how your business fluctuates and how many transactions are going through. How close you might be to your bank overdraft or requiring a bank overdraft, or just because you’re interested. Monthly, quarterly, six monthly, you can guide yourself on that and depending on those circumstances I think. Carol Lewis: Just following on from that, I see quite often that people put quite a lot of effort into budgets but then they don’t necessarily go and put the effort in. I’m looking at their management accounts, comparing them against budget, but investigating the variances. Like, I thought I was going to go and do this, but actually I’ve done this. And then you need to go away and you need to look at why and what’s happened and what’s changed. And how it affects your business. Maybe re-do some of the budget if it’s not realistic. So it’s investing that time in actually making sure that your budget is stacking up against what you’re actually doing. Julie Stanford: It makes sense then if you’re very canny in your business to think that the items that you’re listing are similar across the accounts, the cash flow, and the budget for you to be able to compare. Carol Lewis: When you do your budget, the place you should start is your last year’s accounts. Carol Lewis: Take your last year’s accounts be they management accounts or if you haven’t got them, maybe your annual accounts, and use those headings off there, you know your expense headings. That’s a really good place to start because it’s really hard starting with a blank piece of paper. If you’ve got those headings there it helps you fill in the figures. Julie Stanford: I’m thinking also when you get to the end of that year, you can talk with your accountant about possibly changing how you’re even putting the profit and loss together in terms of the items, because you might find other items more useful in your day-to-day budgeting and cash flow. Because these are supposed to be day-to-day tools to help you manage your business better, aren’t they? Which is why I saw the light in your eyes, Carol, when you were talking about the excitement of figures. Charlie Eve: I think what’s important is that clients and business owners, they’re not meant to be accountants and experts in finance. You understand the business and as accountants, we’re not going to understand the business or be able to do the things that you do within your business. You do what’s good for you and know how that works. We’ll assist to make sure that we can make that business as profitable as possible, or make it into whatever you want to make it. As Carol said at the start, it really depends what your goal is, and not everybody’s goal is to make a whole load of profit. Many people’s goal is to have a business that gives them enough income to enjoy their life, but actually still have the time to have fun. Julie Stanford: Yeah, which is a very good point. Going back to the goal, what’s the point? Why are you in business? Then, everything has to take you toward that goal and the reason you set it up. Carol Lewis: I think that’s massively important if there’s more than one of you as well. Because there’s two of us in our business and we always take the time to sit down together and say where are we going together, you might have different ideas and not realise it. It’s really important to sit down and agree on a common goal. It really helps giving that motivation for both of you to be working the same direction toward the same thing with your business. Carol Lewis: That’s a good byproduct of doing a budget is it really smooths the wheels of managing a business if there’s more than one of you at the wheel. Julie Stanford: Because you’re all agreeing. Carol Lewis: Yeah, where you’re going to go. Julie Stanford: Okay, so let’s think then. We’re coming to the end of our time together on this show. It’s been really interesting to find out about how you can run a business better financially. Any important tips or things you wish your clients would do, if only they understood the magic of figures, Carol? Carol Lewis: I think it’s just generally taking more of an interest in it and quite a lot of people, because obviously they lose a lot of sleep over their financial figures, kind of delegate it to someone else, I think it ultimately is, as a business owner, you’re the person who has all the knowledge about the business and you have to take responsibility for the finances. And if you do delegate it to someone else, say a bookkeeper, to go and actually put the figures together and do the boring numbers and stuff, that you’re reviewing what they’re doing and checking and asking questions and saying, “Why is my telephone bill so massive this month?” It’s your business and you should be taking an interest in the figures and seeing what’s going on really. Julie Stanford: Yeah, you can trust people but you need to be clear about what’s going on ‘under the bonnet’. Carol Lewis: Yeah, it’s your control. Julie Stanford: So Charlie, what’s your tip? Charlie Eve: I think my tip is to try as hard as you can, and with the help of others, to understand your profit, your personal income, and the tax that you have to pay each year, because they’re 3 different things. Julie Stanford: And they’re important, all three of them. Charlie Eve: All very important. Julie Stanford: They are. Well on that bombshell, I just want to say thank you very much both of you. Carol Lewis of Bainbridge Lewis and Charlie Eve of Carpenter Box for joining me on Essential Business Radio.